I know cleanses and juicing is such an 'in' thing right now, but with the holidays not that far in my rearview mirror, I'm thinking that I need to kick start my new year and body into check. Like serious check. I've heard a lot of really good things about the BluePrint Cleanse system and it seems like the right sort of beginner cleanse that I could stick to and reboot my body. 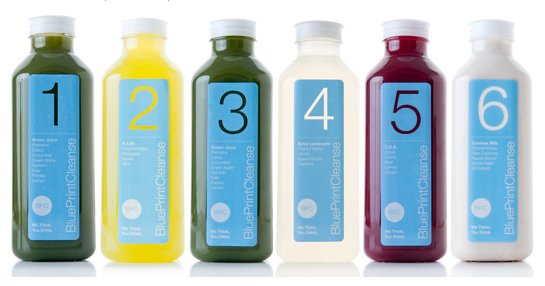 So I'm interested to know, how many of you have tried cleanses or juicing? I'd love to hear your experiences and recommendations! BTW, I always LOVE mommy advice. Especially from women like you who I share things in common with and can relate to. I have ordered the belly bandit thing and will let you know how it works. Thanks for the recs and keep em' coming! I'm loving what I keep hearing about this, have to try! I have been wanting to try this also! I am so afraid I'll spend the money and then not be able to stick with it. I would love to try a cleanse like this. I'd love to hear what you think of it if you decide to do it. They're great, but expensive! I would start with a 1-3 day to see how you do!! I find that local places are the best, compared to Blueprint - I feel like it's fresher and they deliver to your house usually!